A comprehensive breakdown of the website and the business. Our Pre-Offer Assessment sets the highest standard in web-based business analysis. 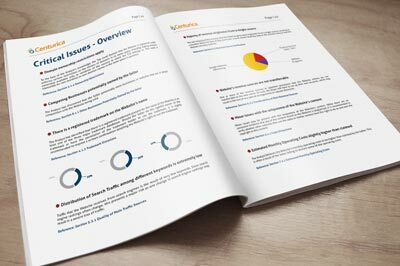 Each report gives you a thorough breakdown of the website and the business behind it. We also provide a professional valuation as part of the analysis. See what’s included or download a sample report below. Standard – 4 Working Days. Rapid (+$99) – 2 Working Days. On our order form, you can see an estimate of your report’s delivery date. In addition to the sales brochure or listing url, we typically only require access to the Seller’s Analytics account associated with the website being sold. With your permission, we can contact the seller or broker directly for any further information we might need. The price of $399 covers analysis on one company / individual seller and one website url. If you would like to analyze more than one website or domain, the first additional domain is charged at $199.50 and all further domains are charged at $99.75. Drawing on our own data, our subjective opinion based on industry experience and publicly available information on current market averages, we provide a valuation range for your potential purchase. In addition to the valuation itself, we also detail the factors that increase the value and those which decrease it too. This provides an insight into potential opportunities to increase the website’s value if you make the purchase. Most web-based businesses rely on search engines for at least some traffic. Failure to comply with their terms and policies can eventually result in a penalty or worse, a complete ban. This causes lost traffic and lost revenue several months after you’ve made the purchase. We analyze several factors to assess the quality, compliance and uniqueness of the website being sold, reporting on any potential issues that would need correcting. Potential Trademark Violations. Registered trademarks in the website’s name or its domain name are a serious threat to the business. The owner of the trademark could claim ownership of the domain name, or take legal action against you as the new owner. Potential attempts to Falsify Analytics. Our sanity check on the website’s key visitor metrics attempts to benchmark the site against industry averages. This can flag situations where low quality content leads to poor engagement or where the seller has modified their analytics code to deceive potential buyers. Dependence on Third Parties. Most sites utilize products or services from third-party vendors. We look for any dependence that can’t be easily replaced and pose a threat to the running of the site if they no longer existed. Loss of traffic and ultimately loss of revenue is one of the most common ways a new purchase will fail within the first 12 months of ownership. Many of the causes for traffic loss can be identified before the site is sold. Our Traffic and Marketing assessments give you an early warning. We analyze every major traffic source that brings new and existing visitors to the site. For each one, we look at the quality, sustainability and the overall dependence the site has on it. This helps identify problem areas upfront. Visitor Engagement. Poor visitor engagement can be a sign that the website’s content is low quality or irrelevant for the majority of visitors the site receives. This is common with sites that generate content automatically and can lead to problems in maintaining future traffic levels. Keyword Rankings. Losses and declines of main keywords in search engines such as Google can be an early warning that the site is about to be penalized or lose traffic. On the contrary, a big shift in the opposite direction can sometimes identify businesses poised for rapid growth once you’ve made the purchase. Paid Traffic. Our paid traffic assessment can sometimes highlight an advert or paid traffic source that the seller has not declared. Dependence on paid traffic sources isn’t a risk on its own, but it is important to check whether the costs have been adequately represented in the financial data supplied by the seller. The Website’s Link Profile. We run an analysis on the website’s backlink profile to give an early indication of any issues that are likely to pose a risk to the website’s long-term search traffic sustainability. Related Social Media Properties. Many sites are sold without all of the connected social media properties being included or transferred with the sale. We look for connections based on public sources and score the site’s overall social presence to give you an overview of the quality and authenticity of its social followers and fans. In addition to analyzing every traffic source to the website, no assessment would be complete without a thorough overview of each revenue source too. We examine all main revenue sources in detail, looking at their contribution and sustainability to identify risky or short-term streams of cash-flow. The Transferability of Revenue Accounts. Often unknown to potential buyers, some revenue accounts cannot be transferred, only recreated. At best, this will only mean loss of history (affecting the resale value of the business you’ve purchased) but worse-case scenario can mean loss of customers or subscribers too. Google AdSense Compliance. For sites that use Google AdSense, failure to comply with their terms results in termination of the website’s AdSense account. Naturally, this will cause disruption to revenue and in some cases, total loss of revenue for several months. We assess any areas where the website is likely to fall short so they can be addressed ahead of time. Revenue Metrics. We assess the website’s key revenue metrics against industry standard benchmarks. This helps to potentially identify situations involving inaccurate, inflated or fraudulent claims made by the seller. If you would like us to verify that the actual numbers supplied are correct and accurate, take a look at our Live Verification package. The cost and time required to run a potential purchase is often the difference between buying an investment, and buying yourself a minimum wage job. We examine the business for sale, and look at typical functions and skills required to operate it. Based on our own experience, we estimate the time to carry out each function internally. This helps build a picture of what’s required to run the business – one that can be compared to what has been supplied by the seller. Skills required for Operation. Many web-based businesses fail because the buyer isn’t adequately prepared for the skills required to run it. We look at what’s required, the difficulty in learning those skills and the feasibility of outsourcing it. Costs of Outsourcing. For each function required to run the business, we examine the likely cost of outsourcing based on our own experience. This can be used as an indication of what it would typically cost to run the business as a truly passive investment. We carry out a basic background check on the seller to find other websites or web-based businesses that they may own, regardless of whether they’ve been disclosed. In addition to potentially competing with the business they’re selling, other sites they own in the same niche may contain backlinks to, or provide traffic for the site being sold. If you made the purchase and those links were removed, this can have a detrimental effect of your new investment’s traffic. A crucial part of staying safe in making your purchase is knowing exactly who owns the rights to the site(s) being sold. We look for current and past owners of the domain, highlighting any potential changes in ownership that may have happened recently. Not only does this help verify ownership of the business, but it can also help alert you about ‘problem sites’ where someone has purchased the business, but quickly tried to resell it. Restrictions on Ownership. Some domains have special restrictions on who can legally own them, putting your purchase at risk if you fail to meet those criteria. Spam and Blacklist information. If the previous owner or someone using their server has recently sent a substantial amount of unsolicited email, this can negatively affect communication with your customers if you purchase the business. We look for evidence of the business appearing in spam and DNS blacklist databases. The True Website Age. The age of the website isn’t always the age of the domain. We attempt to verify the true age of the website being sold. New sites tend to carry a much higher risk than those that have been operating for longer periods of time. How would you rate your experience in buying web-based businesses? We never send spam or abuse your email address.